The School Partners Program is a collaboration between the Denver Public Schools Foundation, Mile High United Way and the nearly 200 schools in DPS. The program creates tailor-made partnerships between schools and businesses or community organizations to help every DPS student succeed. School Partners provide a combination of volunteer time, in-kind contributions and financial resources to meet the specific needs of their partner school. What does a school partnership look like? That’s largely up to you. The School Partners Program can create a customized partnership that’s exactly the right fit for your organization and your employees. 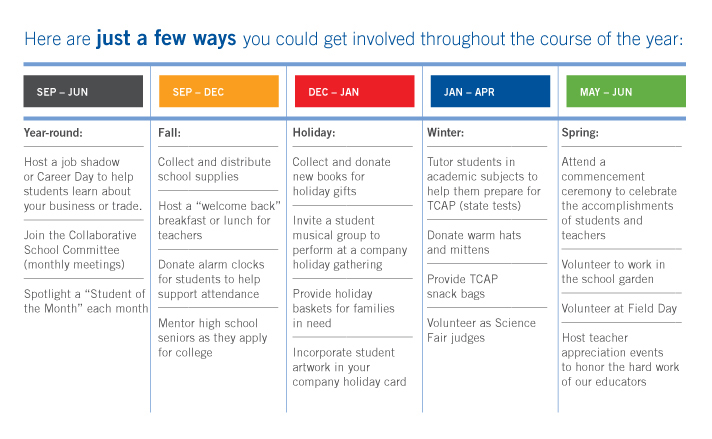 To be considered a School Partner, you must commit to a minimum of four activities with your school each year. There are countless opportunities to engage with schools to meet their unique and diverse needs. You can choose from a long list of meaningful academic, enriching and fun ways to support the students at your partner school.